This weekend was quite liberating. Friday I worked through lunch, so come 4 pm I was done with all my work and got to leave early. Remember my spring decorating fever? I worked on that. I got some candlesticks from Dollar Tree, and decided I wanted a wreath. Not only did I plan out my spring mantle, I went shopping. Y’all. I don’t go shopping anymore. I don’t have the time, energy (mental or physical), and I usually don’t have the money. This time, I had the money… and the time… and the energy. I hit Old Navy, and was reminded that their dresses in-store really don’t work for my body. The petite sizes online are great! I found a few options, but nothing that made me go “Wow.” I decided, early on in my hunt, that I wanted a wow dress. I don’t have a one-stop dress that I can put on without a tank top or a sweater… and I don’t have a dress that makes me feel like a hundred bucks. I had already looked at Target’s selection last week, and was not impressed. I remembered I had a Kohls gift-card, so I decided to stop there on the way home. I took 5 dresses into the fitting room, and the first one was ok, but not awesome so I continued and the next three dresses were nos. The last one I tried on… was perfect. I can go without a sweater, I can go without a tank top for modesty, it is flattering, it’s happy, the blues make my eyes stand out, and it is unlike any other dress I have. I looked in the mirror, frankly stunned, and I knew I had to get it. When I got home, we had homemade Chinese food. Sweet & Sour Chicken, thank you Josh and trusty crock-pot, and stir fry. It was a pretty quiet Friday night, but that’s how we like them. Saturday, we slept in. Until 7:30, but that’s sleeping in for us. We got ready for the day and hit a yard sale. It wasn’t any yard sale, it was put on by a family from our church that is moving overseas… and, hence, selling all their stuff. We got a game, a necklace, a couple of books, and a couple of picture frames. Then, since it was right next door to our friends, we popped in on the Sylvias. Friends, thank you for inviting us in though you were in the midst of cleaning. We so enjoyed spending time with you and your little girl– being with you always brings us such joy. We had planned to do breakfast at Chick-fil-a, but it was 10:35… which meant breakfast was over. Instead, we decided to do Tropical Smoothie which is a bit of a trek, but I’ve been wanting to go so bad. I got Josh hooked. We split a breakfast burrito and got our own smoothies. Next, it was Trader Joes for us. I have been wanting to try their hummus, guacamole, and the tea tree shampoo, and I now declare them all wonderful. But ESPECIALLY THE GUACAMOLE. I’m a little bit addicted. 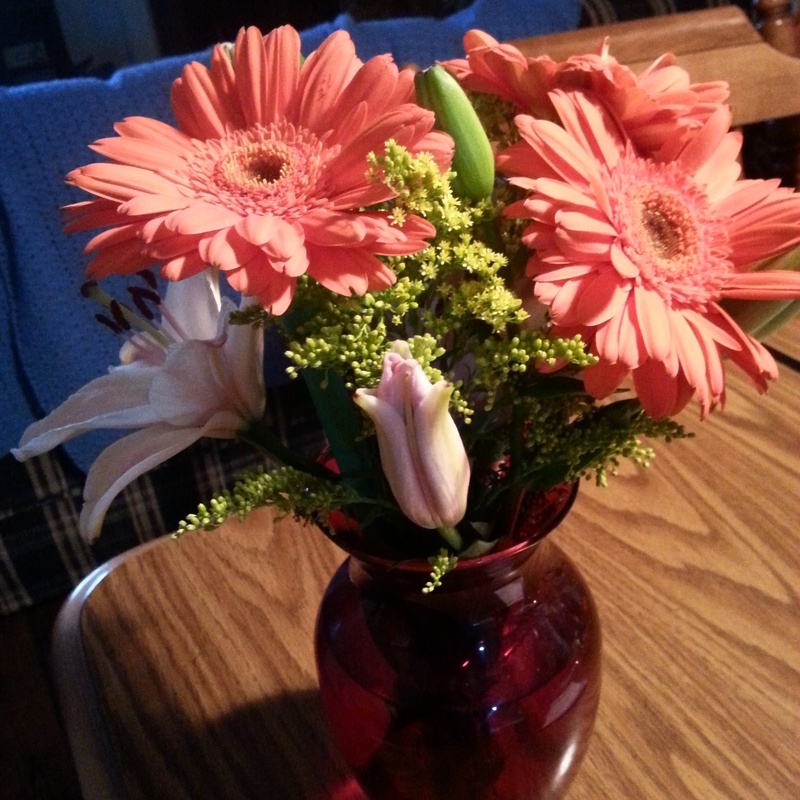 I got a bouquet of fresh flowers, which have brought so much happiness to our dining table. Since we have the Growth Group meal and Aaron’s birthday this week, we did our grocery shopping together (which never happens anymore). We spent the evening enjoying blueberry pancakes, basketball, and The West Wing. Our Sunday was also low-key… more basketball (I got 3/4 final four teams right! ), leftovers, and West Wing. This week is really packed, and I am super stressed. I feel like I can’t make enough food… I’m constantly cooking. We have growth group meal this week, I committed to taking a dessert to Easter, it’s Aaron’s birthday and his requests are not easy to execute (especially after a long week of work)… and I feel like I’m never home. Also, in the one time slot I had to prepare said Easter dessert, I realized my recipe was not sufficient and made the worst cake ever. Needless to say, I’m not feeling the best today. 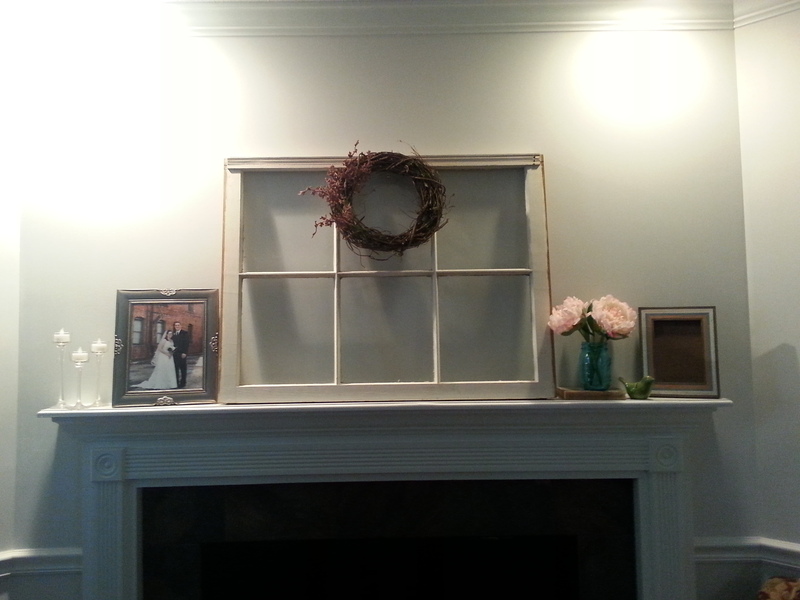 A terrible picture of our mantle. Also, that empty frame? I have simply not printed a drawing of a bunny. That’s the Easter decoration touch. I feel like life has been so busy, and it shows no sign of slowing down. So, thank you for carving out time for me and protecting it. I am beyond excited that you can no longer live in ignorance of Tropical Smoothie’s awesomeness… and I’m excited about more dates there. First, though, we have to survive this week… and frazzled doesn’t even begin to cover how I’m feeling.